We have long been admiring Mike Reynolds and his Earthship designs, that started out in the 1970s in Taos, New Mexico, and has spread to many places across the world. 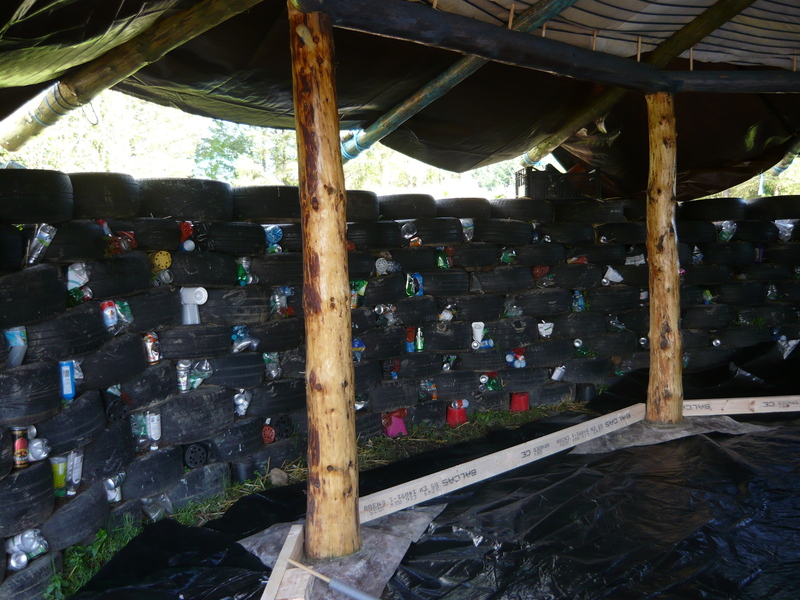 The Earthship uses old car tyres as a major building component. 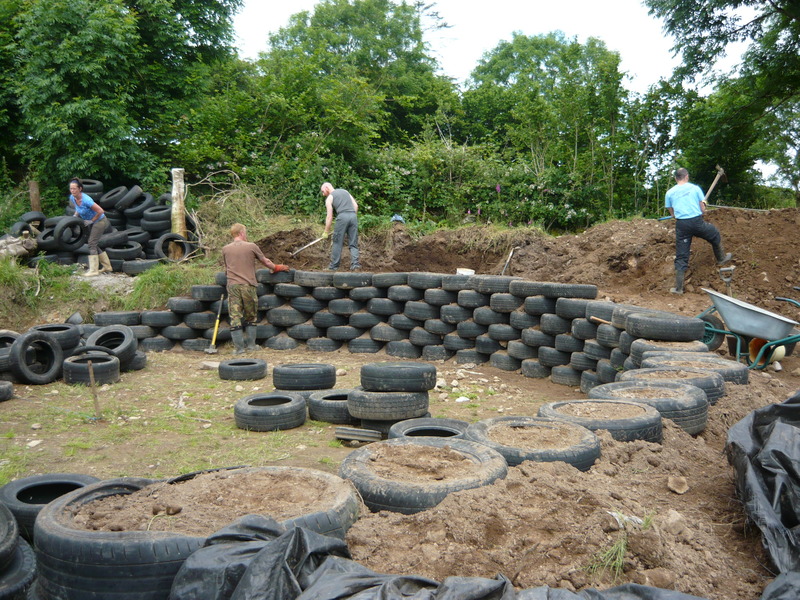 When it was time to start the extension to our little cottage, we decided to build a semicircle tyre wall on the north and east side of the planned space. The purpose of the wall is to hold the earth-bank in place and protect the building from the worst of the elements. The first long, hard, but essential part of the construction was getting the drainage sorted out. We dug a ditch and added a perforated drainage pipe along with gravel and a permeable plastic sheet to protect it from clogging up. We then backfilled it with earth and levelled the whole area. It is important to have a level and stable surface for your first layer of tyres. It takes about two whole wheel barrows of soil to fill one tyre. 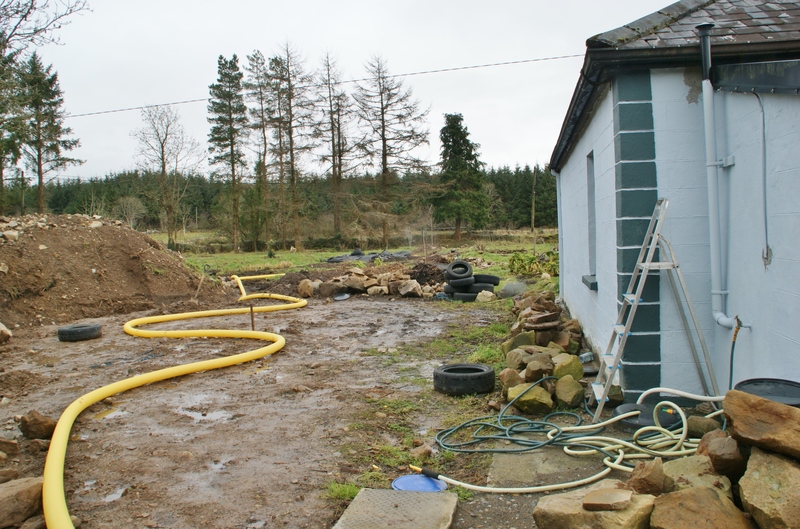 We had a lot of soil for this purpose as when we moved in, the area behind the house was sloping and had to be levelled out for the extension. Each layer consists of 25 tyres and we added 12 layers in total. 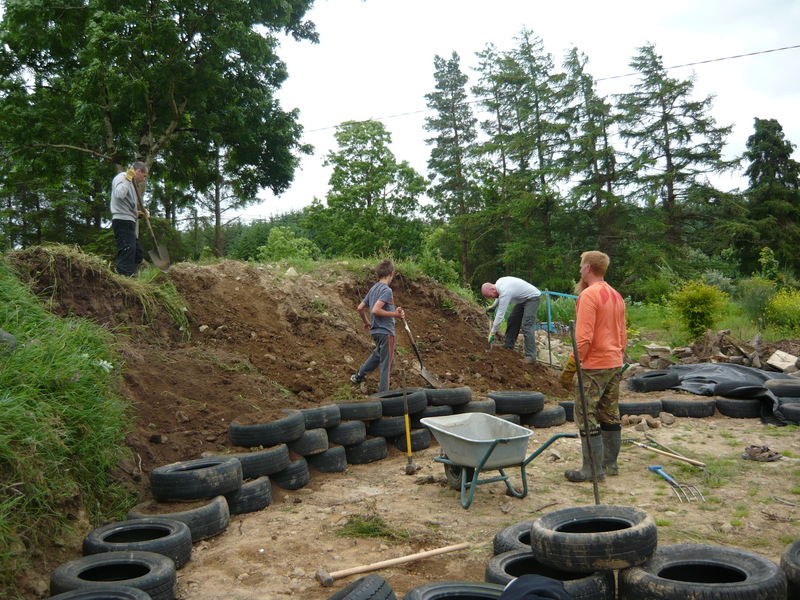 Thankfully we had friends around for some of the backbreaking work of filling and emptying 600 wheelbarrows of soil for the wall and at least 800 more wheelbarrows of soil to fill the space behind the tyres, rebuilding the earth-bank. The soil needs to be compacted into the tyre by pounding it with sledgehammers. You can use small lump hammers at first to get the soil into the rim and then fill it and pound in a circular motion across the top. We were not overly concerned about getting the tyres perfectly filled, as this is just a retaining wall that will be plastered over and not a part of the actual building. You do need to be careful though when choosing your tyres for each position and layer, as you are likely to have a selection of sizes. 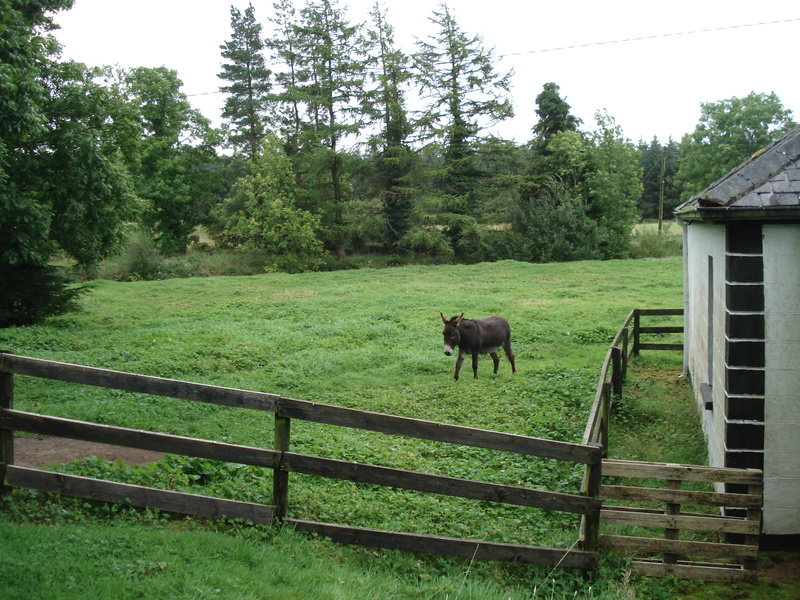 Think about your project as a giant jigsaw puzzle where you want each row to be as uniform as possible. It is very rewarding to use a material that is a by-product of our modern society in a constructive way. Getting tyres is easy. If you go to ask at a tyre changing place, remember that you are in a position to bargain a bit. The place is likely to have to pay quite large amount of money to dispose of their tyres, so you asking for them is going to save them a lot of money. Ask politely if they can deliver them for free. They may even pay you a little bit to take them. We do not like to think about how much it would have cost us and the environment to build our wall out of a more commonly used material, like concrete blocks and cement. 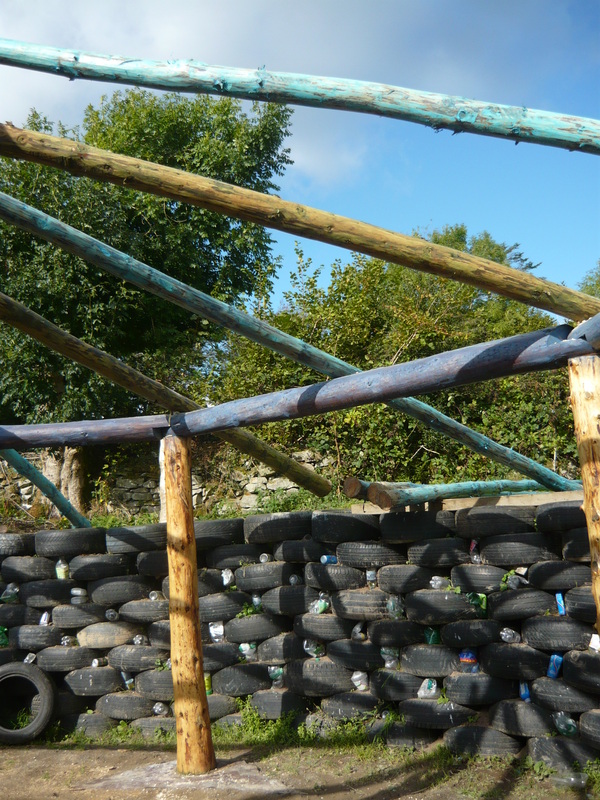 The spaces in the wall are filled with old plastic flowerpots, drinking cans and plastic bottles etc. to save on the amount of render we are planning to use. ← How to increase your bird population.